Malnutrition is a recurrent and devastating emergency affecting hundreds of thousands of children in Chad every year. “It’s serious for children here,” says Bernadette Ammaji, 37, as she prepares food for malnourished children and their mothers at Médecins Sans Frontières (MSF)’s therapeutic feeding centre in Bokoro town, central Chad. Bernadette, who has worked with MSF since 2012, is one of more than 200 staff working to tackle malnutrition in the region. Malnutrition is endemic in Bokoro, as it is across much of Chad, with almost half of child deaths in the country associated with the condition. Bokoro region lies around 300 kilometres east of Chad’s capital, N’djamena, towards the centre of this landlocked central African country. It’s a relatively stable part of the country, but is also neglected and usually out of the headlines due to Boko Haram’s creeping presence in the northwest of Chad. This year, in villages across the Bokoro region and in partnership with the Ministry of Health (MoH), MSF is running 15 mobile outpatient clinics for malnourished children aged between six months and five years old. In Bokoro town, MSF has an Inpatient Therapeutic Feeding Centre in an MoH Hospital with an intensive care unit where the sickest children are referred. For the first time, MSF is also working in the area to identify and try to prevent children at risk of malnutrition from falling ill.
At the moment, hundreds of women bring their babies to MSF’s mobile outpatient clinics every day, as the number of children with malnutrition reaches its annual peak. Families haven’t yet collected this year’s harvest, but last year the harvest was bad and some people have run out of food. 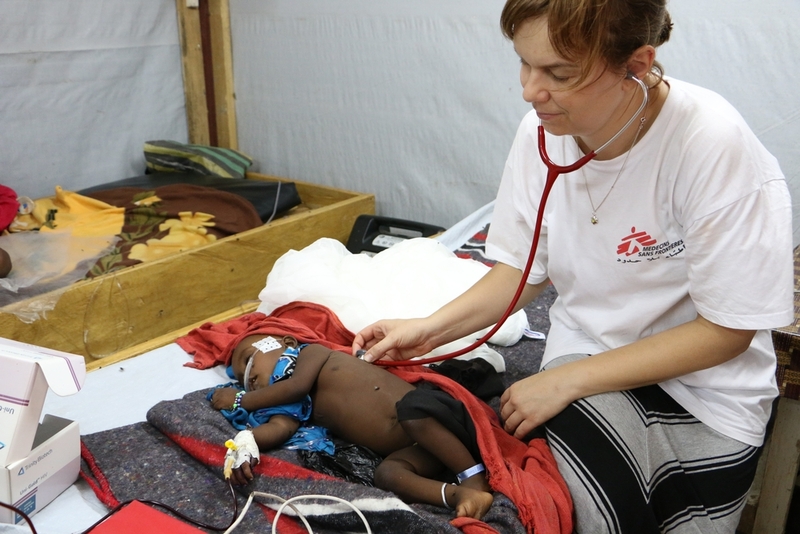 Last month, MSF transferred an average of 50 babies every week from the outpatient clinics to its intensive care unit in Bokoro for emergency care. Babies and young children in Bokoro also fall into malnutrition due to cultural practices that can unintentionally cause more harm than good. “Some mums here say that when their next child is conceived, their breastmilk is not good for their existing child,” says Benedicte La-Toumbayle, 28, a Chadian nurse at MSF’s therapeutic feeding centre in Bokoro town. “They think that by continuing to feed their baby breastmilk, they will harm the future child in their womb.” Mothers often prefer to take their sick child to a religious leader rather than a health clinic. In the best cases, this can delay malnourished babies getting the treatment they need and in the worst cases vulnerable babies, whose immune systems have been weakened by a lack of food, can die from poison or infection. Compounding these risk factors is a widespread lack of understanding across Bokoro about nutrition. “Instead of breastmilk, mums sometimes feed their babies goat’s milk or ‘bouille’ [a type of broth often made from millet], or other ‘adult’ food like this, and then the child gets diarrhoea and falls into malnutrition,” says Benedicte. Education rates are low with a national literacy rate of just 33 per cent and most of the mothers MSF sees here haven’t spent a day at school. Many don’t understand what it is that’s making their children ill.
A short lesson on hygiene and nutrition is a core part of each mother’s visit to either MSF’s outpatient clinic or intensive care unit. MSF has launched an emergency response to malnutrition in Bokoro at this time of year four times in the last five years. Over that time, it has become clearer that these aren’t one-off emergencies, but part of a pattern of recurring malnutrition with complex, interconnected causes. As a result, this year MSF started work in Bokoro before the malnutrition cases peaked at the start of the rainy season (May to October), setting up its outpatient clinics in January instead of July. Since then, MSF has treated more than 9,140 babies and children for severe malnutrition. This year, MSF has also set up a component to the project that works to prevent babies and young children from getting malnourished in the first place. The MSF teams have distributed ready-to-use supplementary food, as well as mosquito nets and soap to more than 30,000 mothers across Bokoro, along with a short health and nutrition lesson. The work is hard but staff feel passionately that it’s what is needed if MSF is to make an impact on recurring malnutrition.